Visit the showcase site for Soundscapes. Listening without boundaries—Total Access to the music of the world. Music doesn’t stop at the border, and neither should your textbook. This text gives students a global sense of music and its significance across cultures by introducing them to a diverse repertoire and developing listening skills applicable to all music. 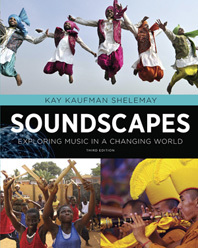 An accessible three-part model for listening—sound, setting, and significance—facilitates comparisons of various musical styles and meanings, and with Total Access, Soundscapes provides the digital resources students need to discover new music in a digitally connected world. Soundscapes helps students listen to all music and understand its place in an interconnected world. Using a cross-cultural framework and a three-part organization—Listening to Music, Transmitting Music, and Understanding Music—the book presents music as an ever-changing, geographically unrestrained form of human expression. New video excerpts from all over the world give students the opportunity to contextualize music within its own culture while making connections to the music in their own lives. The book’s three-part model for listening—sound, setting, and significance—gives students a framework for listening to all music, how it functions in people’s lives, and how they consume it. This edition balances coverage of traditional, classical, and popular styles of music from every region of the world. An expanded repertoire—85 Listening Guides featuring 13 new works—provides a comprehensive look at a range of cultures and traditions. Highlights include new works on jazz, Cape Verdean dance, Brazilian capoeira, Ethiopian chant, a classical string quartet, a Creole two-step, and karaoke. Updated case studies expand on previous editions’ global outlook, and a new world map places each Listening Guide in its appropriate geographic location. Music fundamentals are presented from a global perspective. An Indian raga is used to introduce intervals, while rhythm and meter are illustrated by comparing a four-beat, straight-ahead rhyming Bahamian spiritual with Dave Brubeck’s nine-beat Blue Rondo à la Turk. In-Text Listening Guides feature What to Listen For boxes highlighting essential features of each work, and concise headnotes with recording dates, performers, composers, forms, and functions. Interactive Listening Guides—compatible with mobile devices—allow students to focus on essential features as they listen online anytime, anywhere. Further Fieldwork assignments encourage students’ own field research, both digitally and within their own communities. New Try It Out exercises bring music to life through interaction with various traditions, from making a Brazilian berimbau to clapping Indian tala. Refreshed full-color art—35% new to this edition—emphasizes music’s visual role in dance, traditional dress, concert design, and advertising, while individual portraits introduce students to globally influential musicians. New portraits include the Boston Camerata, Ethiopian Church Musicians, and Lei Liang. A pronunciation guide for all foreign terms, Looking Back timelines emphasizing historical context, and end-of-chapter recommendations for Reading, Viewing, and Listening further aid students in exploring outside the classroom. Students can access streaming music, a media-rich ebook, outstanding Interactive Listening Guides for every work featured in the text, video excerpts in every chapter, and chapter and listening quizzes. Introduction: What Is a Soundscape? * indicates repertoire that is new to this edition.